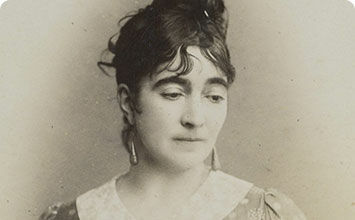 The below artworks are the most important by Marie Bracquemond - that both overview the major creative periods, and highlight the greatest achievements by the artist. Artwork description & Analysis: Bracquemond's Woman in the Garden reveals her roots in academic painting. In 1859, she was accepted as a pupil to the legendary painter, Jean-Auguste-Dominique Ingres. Despite learning a great deal from the French master, she reflected later that she had feared his stern nature and observed that Ingres treated his female students differently in some ways than his male students. She wrote: "The severity of Monsieur Ingres frightened me...because he doubted the courage and perseverance of a woman in the field of painting... He would assign to them only the painting of flowers, of fruits, of still lifes, portraits and genre scenes." That aside, the important art critic, Philippe Burty, referred to Bracquemond as "one of the most intelligent pupils in Ingres's studio." 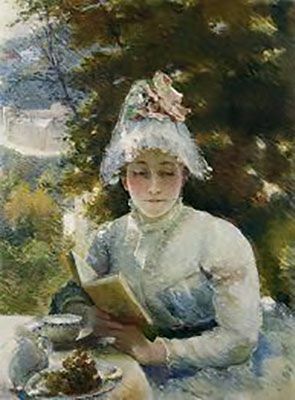 Artwork description & Analysis: By the 1880s, Bracquemond had met Monet and Degas and had begun to incorporate the loose brushwork and wistful, muted, light-infused palette of Impressionism - much to the dismay of her printmaker husband, Félix, who was famously contemptuous of the Impressionist style. 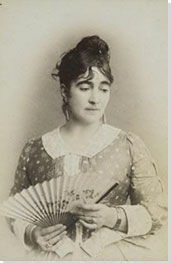 Artwork description & Analysis: Just as her husband, Félix, had drawn Bracquemond into the decorative arts via his role as art director at the Haviland porcelain shop, so he apparently strongly encouraged her to apply her talent as an accomplished draftsperson to printmaking. In particular, etching was his favored form of printmaking and, under his instruction, she excelled. According to her son, Pierre, however, Bracquemond found printmaking far too restrained both because of its typically small format and also because she preferred working with color. 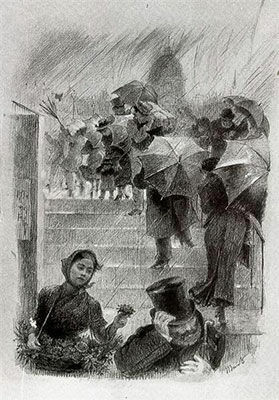 Artwork description & Analysis: Also in a public collection, Three Women with Umbrellas alludes to the artist's roots in academic classicism. Its alternate title, The Three Graces, suggests that, despite her transition to the radical new Impressionist style, Bracquemond was conscious of the longstanding tradition of drawing from themes rooted in classical mythology. 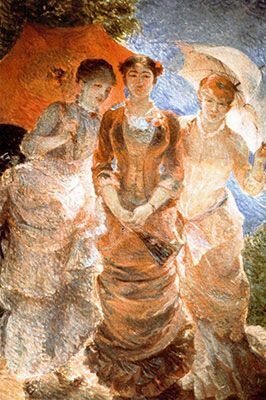 Bracquemond's Three Graces are thoroughly modern, fashionable Parisian women whose umbrellas protect their pale skin from the bright afternoon sun, which has virtually bleached the fabric of their dresses nearly to white. Artwork description & Analysis: In this luminous portrait of Bracquemond's only child, her son Pierre seems to have inherited if not his mother's talent some of her zeal for making art. 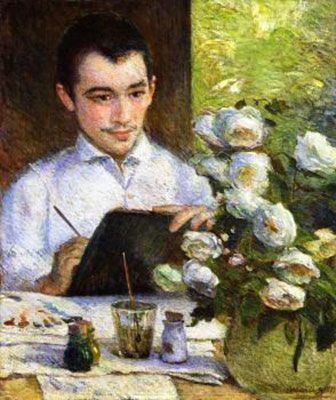 Painting an evidently small-scale still life of cut flowers in a vase, Pierre sits absorbed in his activity at a table in the bright sunshine, seemingly on a terrace - probably at the Bracquemond's home in Sèvres.